Autoship every and save 15% on your first order! and save % on every order! What's this? Learn About The Astonishing Power of Vitamin B-12 and How You Can Benefit From VeganSafe B-12 Today! VeganSafe B-12 is a certified organic, vegan formula that contains methylcobalamin and adenosylcobalamin, the two most bioactive forms of B-12. Although most of us simply know vitamin B-12 as the B vitamin responsible for energy production, it’s important to understand that “vitamin B-12” is actually a catch-all term for a class of vitamins known as cobalamins -- and they’re not equal in their benefits. Methylcobalamin, or methylated B-12 is the most pure, active, bioavailable coenzyme form of B-12 and when paired with adenosylcobalamin, the other coenzyme form of B-12, forms the most potent B-12 combination available. B-12 deficiency is a serious problem that can cause anemia, fatigue, weakness, constipation, weight loss, depression, poor memory, asthma, vision problems, and low sperm count. As a defense against homocysteine, B-12 is nutritional support for your cardiovascular and nervous systems. Fights homocysteine, a cardiovascular stressor. Supports adrenal function and energy production. Essential for cell growth and replication and DNA production. May support a healthy sleep-wake cycle. As many as 30% of adults over 50 are unable to absorb B-12 in food, making supplementation the best source. Research conducted at the University of Oxford study found that vitamin B-12 deficiency may lead to brain shrinkage. B-12 supplementation is not a cure for Alzheimer's disease but preliminary reports suggest a link between vitamin B-12 deficiency and Alzheimer's disease. Vitamin B-12 deficiency leads to megaloblastic anemia, a fatigue ridden condition where red blood cells don't develop properly and can't carry oxygen efficiently. We are sure you will see and feel the health benefits of VeganSafe B-12. Why is VeganSafe B-12 the Best Vitamin B-12 Supplement? 1. What is vitamin B-12? Vitamin B-12, also called cobalamin, is the B vitamin that supports normal functioning of the brain and nervous system, energy production, and for the formation of red blood cells. It’s important to know that vitamin B-12 is a name that refers to a group of vitamins known as cobalamins; this includes methylcobalamin, adenosylcobalamin, hydroxo-, and cyanocobalmin. 2. What is hydroxo- and cyanocobalamin? Cheap, lesser quality forms of vitamin B-12 often used by bargain vitamin companies who add them for marketing purposes. Cyanocobalamin contains a cyanide molecule that must be metabolized by the liver. The process of removing the cyanide molecule uses methyl groups normally used to lower homocysteine levels (higher homocysteine cause stress on the heart). Cyanocobalamin robs your body of beneficial methyl groups and is a perfect example of an instance when low-quality vitamins are worse than no vitamins. 3. 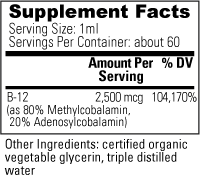 Why is VeganSafe B-12 superior to other cobalamins? VeganSafe B-12 contains adenosylcobalamin and methylcobalamin, a combination that’s better absorbed and used more efficiently in your liver, brain, and nervous system. VeganSafe B-12 does not have to be converted in your liver. Methylcobalamin supports vision whereas cyanocobalamin is thought to be ineffective. Cyanocobalmin is also not recommended for people who smoke, have kidney problems, or don’t metabolize cyanide properly. Energize Your Mind and Body Today With VeganSafe B-12! 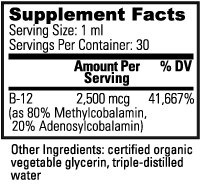 Why is B-12 absorption a problem for some people? Does B-12 affect homocysteine levels? B-12 is the largest vitamin known and difficult to absorb. Additionally, the gut produces something called intrinsic factor, this helps the body absorb B-12. Without intrinsic factor, B-12 just exits the body. As we get older, the availability of intrinsic factor decreases and the risk for B-12 deficiency increases. We all do! However, some folks need to pay special attention. Those who drink, take antibiotics, use antacids, or smoke, vegetarians and vegans, persons with trouble sleeping, pregnant and breast-feeding women, the elderly, people who suffer from celiac disease or have difficulty digesting gluten and absorbing nutrients, and people who are affected by harmful organisms may all be advised to keep their B-12 needs met. Homocysteine levels are an independent stressor on the cardiovascular system and can be responsible for poor heart and cardiovascular health. Vitamin B6 and folic acid work synergistically with vitamin B12 to promote normal homocysteine levels.